The X-Prize, a $10m race to be the first private company to put a craft into space twice in two weeks, will be won soon, believe its organisers. X-Prize chairman Peter Diamandis says it will be secured within five months. 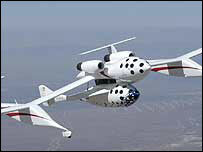 A total of 26 teams are competing, with SpaceShipOne, an entry by aerospace pioneer Burt Rutan, considered to be the favourite to win the prize. Other teams have already started to look at what they might do after the main challenge has been met. Mr Diamandis was speaking at the recent 41st Space Congress held at Cape Canaveral in Florida, US. The competition is to place a three-person spaceship on to a suborbital trajectory - reaching an altitude of 100km - twice in two weeks. The first team to make such a flight will win the multi-million-dollar prize - though in reality, the entrants are likely to have spent much more to make their attempt. Burt Rutan's company, Scaled Composites, has already flown its spacecraft at altitudes exceeding 50,000ft (15,000m) and at supersonic speeds. Insiders speculate he could make a suborbital flight within a few months. Other teams are also poised on the verge of a serious launch attempt. In particular, the Canadian Da Vinci team, which uses a balloon to help its craft reach altitude, is said to be making substantial progress. 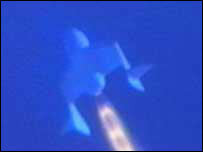 Rutan may make his attempt from Mojave airport in California. The Da Vinci team has already obtained a launch licence in Canada. As the race moves to its climax, the X-Prize Foundation has announced that it will henceforth be called the Ansari X-Prize following a multi-million dollar investment by entrepreneurs Anousheh and Amir Ansari. The Ansari X-Prize Foundation is looking beyond the winning of the prize and considering an annual event that could be held in Florida or New Mexico.